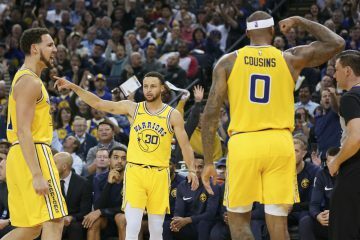 As the rest of the league nervously awaits the Warriors rolling out their explosive attack, some important figures within the organization are slightly more tempered in their expectations. 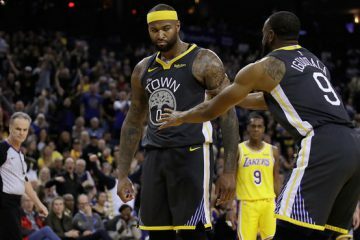 General manager Bob Myers previously hinted that chemistry could be an issue at the beginning with so many new pieces, and now head coach Steve Kerr is voicing his concerns. 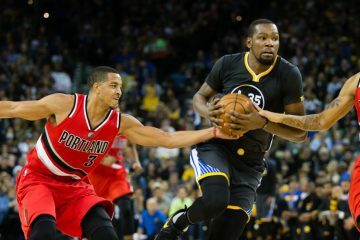 Monte Poole of CSN Bay Area has a great story about Kerr’s trepidations, most of which have to do with the defense of this new team. Nobody seems concerned about whether the Warriors are going to find a way to score points, but they lost some important defensive pieces in their roster maneuvering this offseason, particularly interior stalwart Andrew Bogut. Festus Ezeli is also gone, so the team is really going to have to experiment with some new pieces to try to figure out a way to establish some rim protection. Shot blocking could be provided if JaVale McGee makes that final roster spot, but it’s never a particularly good sign when the 15th man is being counted on to provide an important niche skill for a team lacking in that department. Damian Jones also averaged 1.64 blocks per game his last season at Vanderbilt, so there’s reason for cautious optimism that there will be shot blocking presence inside. However, replacing an elite rim protector like Bogut is going to be difficult, and Kerr realizes it. The Warriors signed Zaza Pachulia this offseason to play center, and although Pachulia can provide rebounding and passing skills with a nice shooting touch, he is unfortunately not a shot blocker. It’s a fair concern to have, but it’s hard to argue that the roster isn’t overall collectively better now than it was last season. As great as Bogut was as a defender and passer, I’d honestly take Pachulia over him in terms of the total package. Pachulia is a good free throw shooter, so the Warriors would never have to feel vulnerable to any “Hack-a-Zaza” tactics. Pachulia had a bad shooting year from midrange last season, but he has proven in the past more than capable of knocking down that 15 footer, which is something that Bogut could never do. Pachulia is also more active on the offensive glass than Bogut is. Pachulia had an offensive rebounding percentage of 13.7% last season, and hasn’t had a season of less than 11% in that category since 2004-2005. Comparatively, Bogut had an offensive rebounding percentage of 9.5% last season, and has only eclipsed 11% in 2 of his 11 NBA seasons. Of course, Bogut holds the advantage over Pachulia in defensive rebounding percentage. 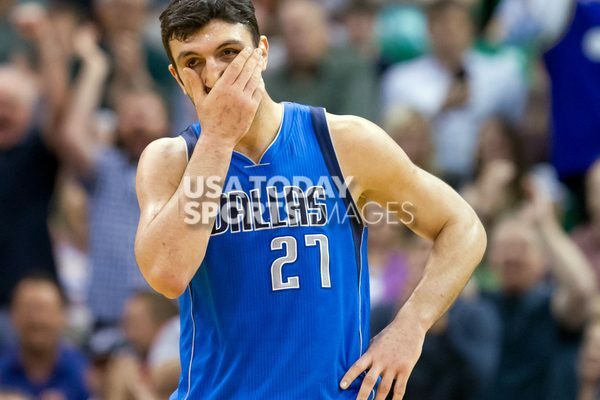 Bogut was at 26% last season while Pachulia was narrowly behind at 25.7%. However, it’s fair to note that Pachulia’s rate was by far his career high, as he had never been above 22% any other season of his career. Conversely, Bogut hasn’t been below 22% since the 2006-2007 season. In terms of total rebound percentage, they’re fairly even. Pachulia has a lower career rate at 16.2%, and actually has only 2 seasons out of his 13 seasons in which he has eclipsed Bogut’s career total rebound percentage. Objectively looking at the numbers, expect Pachulia to be an upgrade on the offensive glass but a downgrade on the defensive glass. Pachulia also has a career shooting percentage from 10-15 feet of .399% compared to Bogut’s .330%. Pachulia is also a good passer. At a more fundamental level, I suppose the change essentially sacrifices shot blocking for a shooting touch. In terms of Kevin Durant replacing Harrison Barnes, I don’t even have to spend time explaining why that’s a significant upgrade. As big of a fan as I was of Marreese Speights, his value was tied to his instant offense off the bench in the form of his 18-20 ft. jumper. His replacement David West actually shoots better from that range than Speights does. Last season, West shot .484% from 16-20 ft. and Speights shot .455% from that same range. West is superior over his career from that distance as well, edging Speights .474% to .435%. It was great that Speights pushed his range out beyond the 3-point arc last season, and unfortunately West doesn’t have that skill. Let’s keep things in perspective, though. Speights shot 62 3-pointers in 72 games last season. It’s not as if the Warriors’ offense, or even the second unit offense, was driven by Speights’ 3-pointers. Speights also has better rebounding percentages than West on both ends of the court, and is especially more proficient on the offensive glass. However, Speights wasn’t deployed in games to provide rebounding. He was instant offense off the bench, and unfortunately didn’t have the defensive capabilities to be depended on for long stretches. Speights averaged 4.7 minutes per game in the NBA Finals, which ranked last on the team among guys who played. Let’s not fall into the trap of inflating Speights’ role in retrospect. West is a bruiser, and has defensive ability that Speights doesn’t possess. Despite being 36 years old, I’d still take West over Speights, at least for this next season. The real debate is going to be whether the team recovers from losing the bench depth of guys like Ezeli, Leandro Barbosa, and Brandon Rush. That’s harder to predict, because many of the guys being ask to fill those voids are either rookies like Jones and Patrick McCaw or young players like Ian Clark who’ve never been leaned on for increased minutes. Again, let’s not blow this out of proportion, though. None of the trio of Ezeli, Barbosa, or Rush averaged more than 17 minutes per game last season. Yes they were dependable rotation guys who could hold their own, but I don’t think the team risks implosion without them. When really examining the additions and departures of this team, I think Pachulia and West are upgrades over Bogut and Speights, but it’s close enough to feasibly go either way, and a case could be made that Bogut and Speights are slightly better. However, those gaps in talent are eviscerated by the upgrade of Durant over Barnes. I don’t even think Barnes’ parents would argue against that. So to break down the debate to a fundamental focus point, it’s really about whether getting Durant was worth losing the bench trio of Ezeli, Barbosa, and Rush. Again, Pachulia for Bogut and West for Speights I consider upgrades, but I’m making a concession for more pessimistic observers. Let’s assume those two changes are net neutral. Wouldn’t you rather have a top 5 player in this league than 3 solid bench pieces? A combination of Jones, Anderson Varejao, and maybe McGee might not be able to approach what Ezeli could do, but again, it’s not a catastrophic downgrade. McCaw looked fantastic in Summer League, Clark had solid points per 48 minutes stats last regular season, and if Kevon Looney stays healthy, who knows what he can contribute behind Durant and Andre Iguodala as that third string small forward. There’s a lot of question marks with that bench, but this starting lineup has 4 of the top 15 players in the NBA. Let that sink in for a minute. Things are going to be okay. Kerr is right to be concerned about the lack of rim protection, but it’s no reason to regret the roster jumbling to get Durant. He’s a generational talent, and I really applaud the front office for being proactive and acquiring guys like Pachulia and West to re-solidify this bench. Iguodala and Shaun Livingston are still leading a formidable second unit. West is a savvy veteran to add to that bunch. The anxiety about a team like this is natural, because the gut reaction from fans is to wonder what’s going to go wrong, because this lineup simply looks too good to be true. Yeah they’re not going to go 82-0, and there’ll be hiccups along the way, but this team truly looks poised to accomplish remarkable things this season. The lack of rim protection is troubling for sure, but to act like it’s going to derail a team full of transcendent players playing the bulk of the minutes sounds like a bit of a reach. Kerr and his staff will mix and match and figure something out, and perhaps a young guy will assert himself. For now, it’s not something to be overly anxious about. We KNOW GSW can score. I have no reason to think zaza is a shotblock guy. Jones? who knows. McGee?….he’s a wild card. reputation as an airhead but.. Can be a shot blocker. Has MATURITY helped? 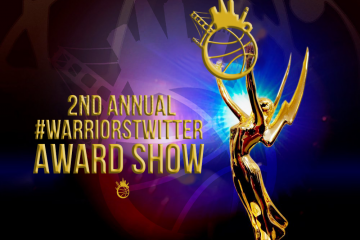 Will GSW’s coaching,, system, leadership revive him? Maybe. McGee CAN be a MAJOR asset or.. a guy we dump. With 4 legit All Star guys…. is “rim protect” even a big deal? I doubt it. I’d LIKE to have that but ANY team playing this team has a HUGE problem on D. GSW can give up some buckets and STILL.. win big.